Here it is, a fiercely Dragon tail without a blade. This Reaver is constructed from high polished 440 stainless steel. Also on the finger line has the links to make your fingers move up or down with the claw. 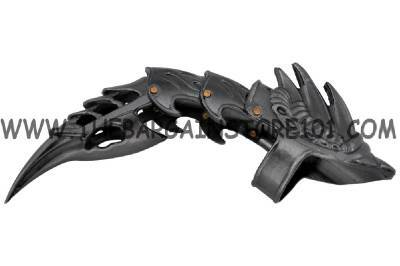 The overall length of this Dragon Tail Flame Iron Reaver Claw measures 5". This is a beautiful decorative finger ring knife with the blade. This is a Dragon tail with Armor Finger Claw. It is a beautiful art of work and will fit on virtually any finger size. Finger jointed moves with the movement of your finger. One size fits all (You can puchase ring size reducers if needed but this is a product we do not offer.) Please note that this is a large size we do not have actual ring size & we do not have the equipment to re-size these rings either. Free Economy Shipping to all 50 US states! We will ship this item to all P.O. Boxes & APO.